The event is organised by Dr. Winny Maboya and her VUT team. The deadline for abstract submission is the 31st of October 2018. Dr. Winny Maboya, a lecturer in the Chemistry Department, has been awarded a PhD at WITS this year. 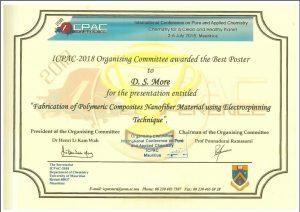 Ms. Dikelede More, a lecturer and DTech student in the Chemistry Department, has won the best poster prize at the ICPAC 2018 conference held in Mauritius on the 2nd to 6th of July 2018. Professor Ezekiel Dikio from the Department of Chemistry was a plenary speaker at the Nano Research Group conference at the University of Nigeria. He received an award of excellence for his presentation on Metal Organic Frameworks (MOF) used as adsorbents to clean water. Thokozani Xaba, a lecturer in the Chemistry Department, has been awarded a DTech during the September 2017 graduation. She has won the very prestigious first prize for her poster presentation at the 7th Green Chemistry International IUPAC 2017 conference in Moscow. Previously she has won the first prize for her poster presentation at the 5th Green Chemistry 2014 Conference in Durban and the first prize for her oral presentation at the 5th Nano-Africa 2014 Conference in the Vaal Triangle-Vanderbijlpark. 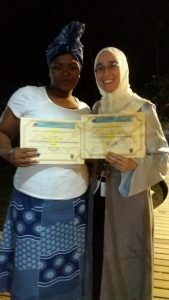 Thokozani has also received the VUT RATE teacher’s award as well as the VUT research Achievement award. Prof Ofomaja is Chemistry’s NRF rated professor. He has successfully applied and received funding under the National Natural Science Foundation of China (NSFC)/NRF Cooperation for 2018. He has also received external funding from Sasol for 2016, 2017 and 2018. Dr Pakade has received Y2 NRF rating in 2017. He has also received yearly NRF Thuthuka funding since 2014. He has also been awarded the VUT Achievement award for research. Semakaleng Kganyago, a MTech student in the Chemistry Department doing research on the effect of the cobalt oxide nanoparticle’s size and shape on the Fenton catalytic activity. She has won the second prize for her oral presentation on her research at the 7th Annual Nano Sciences Young Researchers Symposium (NYRS) hosted at Tshwane University of Technology (TUT)in Pretoria on the 20th of October 2017. Last year she won the first prize for her oral presentation at the 6th Annual Nano Sciences Young Researchers Symposium (NYRS). Obakeng Nchoe received the second price for his oral presentation at the annual SACI Young Chemistry Symposium hosted at the University of Johannesburg on the 13th of October. Obakeng’s presentation was on his research on cleaning polluted water by adsorption. The focus is the isolation and identification of phytochemicals and the testing of their anti-bacteria properties. Mtunzi, F.M., Ejidike, I.P., Ledwaba, I., Ahmed, A., Pakade, V.E., Klink, M.J., Modise, S.J. Solvent-solvent fractionations of Combretum erythrophyllum (Burch.) leave extract: Studies of their antibacterial, antifungal, antioxidant and cytotoxicity potentials. (2017) Asian Pacific Journal of Tropical Medicine, . Article in Press. Pakade, V.E., Molefe, E.D., Tavengwa, N.T. Matamela, T., Green, I.R., Mtunzi, F.M. A novel biflavonoid from rhus leptodictya. (2016) Natural Product Communications, 11 (9), pp. 1279-1280. Muleya, E., Ahmed, A.S., Sipamla, A.M., Mtunzi, F.M., Mutatu, W.
Pharmacological properties of pomaria sandersonii, pentanisia prunelloides and alepidea amatymbica extracts using in vitro assays. (2015) Journal of Pharmacognosy and Phytotherapy, 7 (1), art. no. 5E91750300, 8 p.
The focus is the preparation of nano-materials with different sizes and shapes. Xaba, T., Moloto, M.J., Moloto, N.
(2018) Digest Journal of Nanomaterials and Biostructures, 13 (1), pp. 49-55. Sithole, R.K., MacHogo, L.F.E., Airo, M.A., Gqoba, S.S., Moloto, M.J., Shumbula, P., Van Wyk, J., Moloto, N.
(2018) New Journal of Chemistry, 42 (4), pp. 3042-3049. Mofokeng, T.P., Mabena, G., Moloto, M.J., Shumbula, P.M., Mubiayi, K.P., Nyamukamba, P.
Temperature influence on the lactose capped metal sulphide nanoparticles (2017) Chalcogenide Letters, 14 (8), pp. 347-355. Viljoen, E.L., Moloto, M.J., Thabede, P.M.
Impact of acetate ions on the shape of Co3O4 nanoparticles (2017) Digest Journal of Nanomaterials and Biostructures, 12 (2), pp. 571-577. Xaba, T., Moloto, M.J., Al-Shakban, M., Malik, M.A., O’Brien, P., Moloto, N.
The effect of temperature on the growth of Ag2O nanoparticles and thin films from bis(2-hydroxy-1-naphthaldehydato)silver(I) complex by the thermal decomposition of spin–coated films (2017) Materials Science in Semiconductor Processing, 71, pp. 109-115. Xaba, T., Moloto, M.J., Nchoe, O.B., Nate, Z., Moloto, N.
Synthesis of silver sulfide nanoparticles through homogeneous precipitation route and the preparation of the Ag2S-chitosan nanocomposites for the removal of iron(II) ion from wastewater (2017) Chalcogenide Letters, 14 (8), pp. 337-346. The focus is on the removal of organic and inorganic pollutants from water through adsorption. Maremeni, L.C., Modise, S.J., Mtunzi, F.M., Klink, M.J., Pakade, V.E. Adsorptive Removal of Hexavalent Chromium by Diphenylcarbazide-Grafted Macadamia Nutshell Powder (2018) Bioinorganic Chemistry and Applications, 2018, art. no. 6171906. Okoli, C.P., Ofomaja, A.E. Degree of time dependency of kinetic coefficient as a function of adsorbate concentration; new insights from adsorption of tetracycline onto monodispersed starch-stabilized magnetic nanocomposite (2018) Journal of Environmental Management, 218, pp. 139-147. (2018) Environmental Nanotechnology, Monitoring and Management, 9, pp. 141-153. (2018) International Journal of Environmental Studies, pp. 1-18. Article in Press. (2018) Microporous and Mesoporous Materials, 266, pp. 252-267. Hlungwane, L., Viljoen, E.L., Pakade, V.E. Macadamia nutshells-derived activated carbon and attapulgite clay combinMacadamia nutshells-derived activated carbon and attapulgite clay combination for synergistic removal of Cr(VI) and Cr(III)ation for synergistic removal of Cr(VI) and Cr(III). (2018) Adsorption Science and Technology 36(1-2), pp. 713-731. Pakade, V.E., Nchoe, O.B., Hlungwane, L., Tavengwa, N.T. Sequestration of hexavalent chromium from aqueous solutions by activated carbon derived from Macadamia nutshells. (2017) Water Science and Technology, 75 (1), pp. 196-206. Moyo, M., Pakade, V.E., Modise, S.J. Biosorption of lead(II) by chemically modified Mangifera indica seed shells: Adsorbent preparation, characterization and performance assessment. (2017) Process Safety and Environmental Protection, 111, pp. 40-51. Unuabonah, E.I., Agunbiade, F.O., Alfred, M.O., Adewumi, T.A., Okoli, C.P., Omorogie, M.O., Akanbi, M.O., Ofomaja, A.E., Taubert, A.
Facile synthesis of new amino-functionalized agrogenic hybrid composite clay adsorbents for phosphate capture and recovery from water (2017) Journal of Cleaner Production, 164, pp. 652-663. Igberase, E., Osifo, P., Ofomaja, A. Mathematical modelling of Pb2+, Cu2+, Ni2+, Zn2+, Cr6+ and Cd2+ ions adsorption from a synthetic acid mine drainage onto chitosan derivative in a packed bed column. (2017) Environmental Technology (United Kingdom), pp. 1-18. Article in Press. Ouma, I.L.A., Naidoo, E.B., Ofomaja, A.E. Iron oxide nanoparticles stabilized by lignocellulosic waste as green adsorbent for Cr(VI) removal from wastewater. (2017) EPJ Applied Physics, 79 (3), art. no. 30401. The focus is on the removal of organic pollutants from water using photocatalytic degradation and oxidation catalysis. Kotlhao, K., Mtunzi, F.M., Pakade, V., Laloo, N., Ejidike, I.P., Modise, S.J., Moutloali, R.M., Klink, M.J. Enhancing the photocatalytic degradation of selected chlorophenols using Ag/ZnO nanocomposites (2018) MRS Advances, 3 (36), pp. 2129-2136. ReddyPrasad, P., Ofomaja, A.E., Bobby Naidoo, E. Retraction notice to “Preparation of CN-dots/F-NiO nanocomposite for enhanced photocatalytic degradation of selected organic pollutants” [Appl. Surf. Sci. (2015) 13–21](S0169433214025070)(10.1016/j.apsusc.2014.11.042) (2018) Applied Surface Science, 441, p. 1089. Ultrasonic synthesis of high fluorescent C-dots and modified with CuWO4 nanocomposite for effective photocatalytic activity. (2015) Journal of Molecular Structure, 1098, pp. 146-152.